Burgh de Rott is a dreary, run down town that appears to be in dreadful need of repair. It doesn't look to be the sort of place anyone would want to visit, let alone live in, but if you gain access to the city you will discover just how useful and rewarding it can be, offering new quests, exotic areas, and a fun and challenging Activity! Note: This guide covers Burgh de Rott and its attractions after completing In Aid of the Myreque. If you have not completed the quest, some of the town's features will not be available to you. These attractions are marked with a "†" symbol after their name. To unlock them, you will need to repair each one individually during the course of the quest. The most difficult part of reaching Burgh de Rott is making your way through the swamp. Because of this, the guide will not cover how to get to Canifis in depth, but the routes through the swamp only. 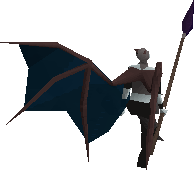 Canifis can be reached in a variety of ways: Walking from Varrock, Teleporting to the Ectofuntus and walking east, or (the fastest method) a Kharyll Teleport. If you pass through the swamp, you will come into contact with ghasts. A solution to this is to bring a Druid Pouch. By casting bloom on rotten logs with a Silver Sickle (b) or Ivandis Flail, you can fill it with whatever grows to keep them from rotting your food. This can be time consuming, however. The other option is to simply not bring food or a druid pouch. You risk taking damage from the ghasts, but, if you have fairly high combat level, this shouldn't be much of a problem. The fastest route through the swamp is the Swamp Boat Pass. You begin by entering an underground tunnel via the trapdoor behind Canifis bar. You will then find yourself in a small room, which you can exit by finding a hidden door in the wall. If you follow the passage to the end, you will find yourself at a pair of doors. Walk through the doors to exit the tunnel and find yourself in the swamp. Cross over the bridge to the south, and continue south until you find yourself at the swamp boat. You can ride it the rest of the way to Mort'ton. Burgh de Rott is just a short walk from there. Note: To take this route, you must have fixed the bridge in In Search of the Myreque. This path simply involves walking through the swamp. It is much more time consuming and you will run into more Ghasts than the Swamp Boat Pass. 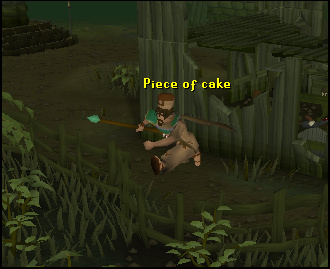 You can shorten your path by taking the Haunted Mines Shortcut and/or the Fairy Rings Shortcut (must have completed Fairy Tale: Pt. 2). You may need to take it if you want to recharge your prayer points at the Nature Altar, or you do not have the requirements to take route one. Once you have reached the town gate, you will find that the citizens are less than welcoming. To gain their trust, you must place food in the nearby chest (shown in picture below). Any type of food will do. 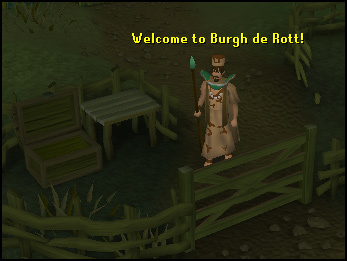 Once you have done that, you will be able to enter Burgh de Rott. Upon entering the city, you will find yourself in the town square. It doesn't appear to be much at first. A well sits in the middle of the square, and several shabby-looking people wander the streets. It is here, however, that you can start the Temple Trekking Activity. To do so, talk to any of the six NPCs that contain both a first and last name, and choose the option that says "I can take you to Paterdomus." Be aware that this can be a dangerous Activity, however. For more information, visit the Temple Trekking guide. Southeast of the town square, you will find the pub. If you're in for a drink you're out of luck- there is no bartender and the pumps are dry. This bar is essential, however, to those wishing to complete the quests in the Myreque series. By climbing over the rubble in the Northwest section of the building, one can access the Myreque hideout, where four members of the organization reside. 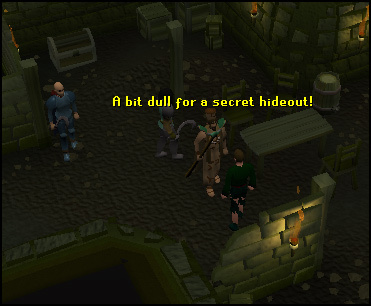 You will have to visit this location during In Aid of the Myreque, The Darkness of Hallowvale, and The Legacy of Seergaze. 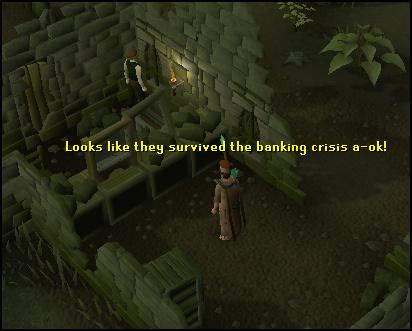 A very important location is the town's only bank. 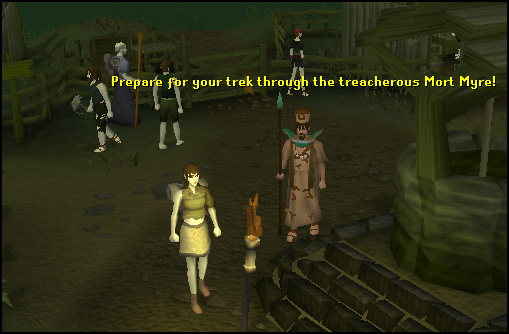 It is just as run-down as the rest of the town, but it is here that you can cash in your rewards for escorting travelers to Paterdomus in Temple Trekking. It also is relatively close to a furnace and fire, and can be used for the three nearby Activities (Shade Burning, Temple Trekking, and Barrows). After completing the first two quests in the Myreque series, one can access the ancient city of Meiyerditch, an enormous mazelike city where you can complete quests number three and four in the series, by traveling on the rickety-looking boat. You can find the boathouse at the edge of the town, along the shoreline. The General Store is located in the northern part of town. 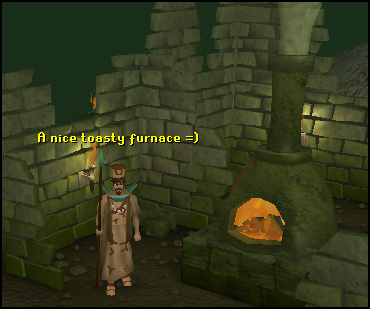 Another useful attraction in Burgh de Rott is the furnace. 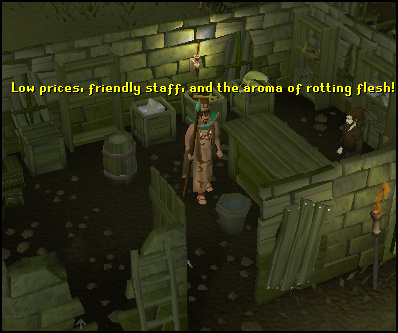 It is located fairly close to the bank, and is a fair spot for training the Smithing skill. 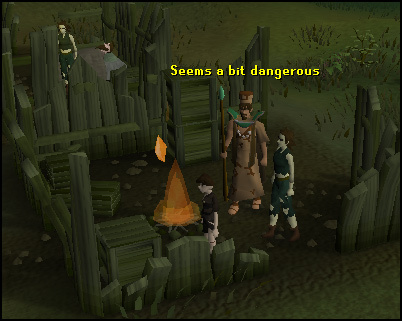 For those of you using Summoning familiars for the nearby Activities, there is a small Obelisk conveniently located just outside the city gates. You can recharge your Summoning points there. Be aware that this is not a Full-sized Obelisk, however, and cannot be used to infuse pouches or make scrolls. The city gate is not the only way to gain access the city. There is a spot of fence that you can jump over along the western edge of town. This is useful for those coming from or going to the Haunted Mine. Note that you must have gained access to the town the normal way at least once before using this shortcut. Burgh de Rott also contains a spot where you can train the Cooking skill. There is a small fire located in a house just east of the bank. It is only a few steps from the bank, and is rarely, if ever, crowded. More adventuresome players can find things to do, as well. Just west of Burgh de Rott is the forest. 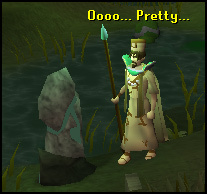 Those slaying Vyrewatch and Juvinates will find plenty of specimens on which to train their combat skills. 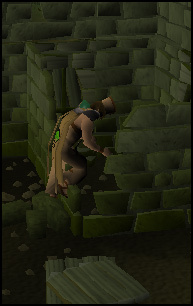 Be warned, however: the Vyrewatch's levels range from 110 to 140 and they are highly aggressive. Not only that, but if you do not have the right equipment, you will not be able to damage them or the Juvinates. For more information, see the Juvinate Slaying and Legacy of Seergaze guides. 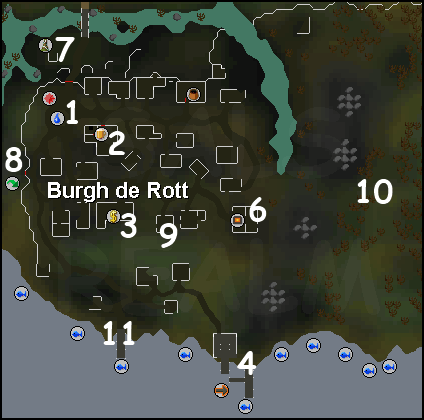 Burgh de Rott is also a prime location for training the Fishing skill. 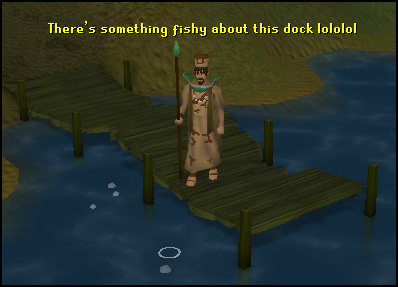 Fishing spots line the coast, and there are several located around the small pier. There, you can use nets and harpoons to fish for a variety of sea creatures. 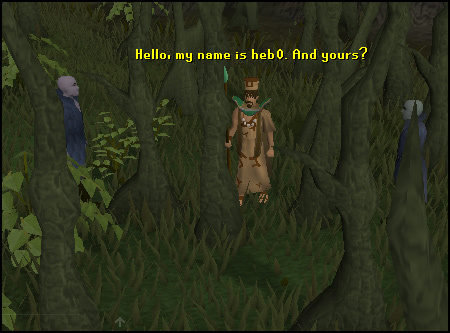 This website and its contents are copyright © 2002 - 2014 Sal's Realm of RuneScape. All Rights Reserved. Website design by Fatalysm, Neo Avatars, and Salmoneus. 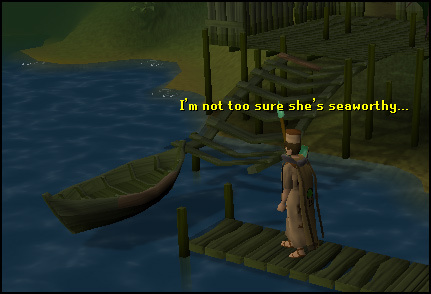 RuneScape ® is a registered trademark of Jagex Limited. Copyright © 1999 - 2014 Andrew Gower.